The Astronomer and I dined at Hoài Huế three years ago on a double date with my grandparents. Back then, the restaurant occupied a sad space that was dark, dingy, and cramped. The food and service were both good, but the ambiance was pretty pathetic, even for a Vietnamese joint. 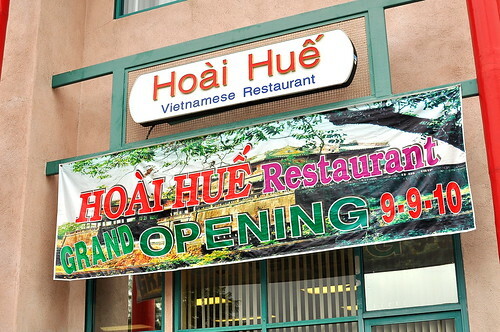 Recently, Hoài Huế moved into infinitely superior digs a few blocks west on El Cajon Boulevard. On our lastest trip to San Diego, The Astronomer and I lunched in the new space along with my grandparents, mom, and cousin Jimmy. Even though it had only been open a short while, Hoài Huế was totally packed—good news spreads rapidly in this food-loving community. 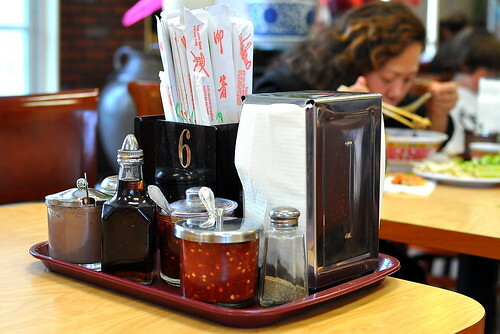 The new restaurant is brightly lit, clean, spacious, and humming with happy noodle slurpers. We immediately scored a table for four, but had to wait for the one next to it to clear out. By the time the rest of our party arrived, the table was ready to go. 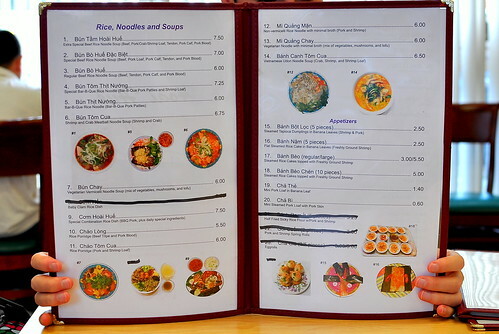 What I really, really liked about Hoài Huế was its concise menu. With fewer than twenty dishes on offer, most of which were from Central Vietnam, it was clear what the restaurant excelled at. Twenty dishes is extensive compared to the one-dish shacks in Vietnam, but a vast improvement from the tomes I’m presented with at most Vietnamese-American restaurants. 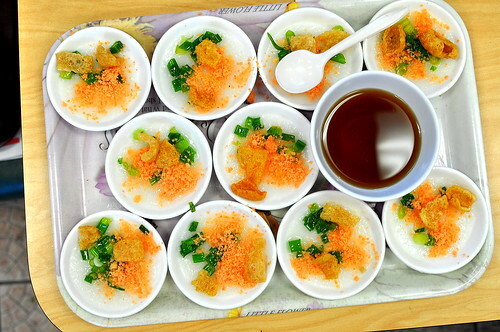 Our party of six started our midday meal with three orders of bánh bèo chén ($5), which came topped with pulverized shrimp, scallion oil, and pork rinds, and was served with a dish of sweet fish sauce. The rice cakes and toppings were more than adequate, but the fish sauce’s seasoning was slightly unbalanced. After one bite, my grandma declared that her version was superior. I nodded in agreement. My family has ordered various steamed cakes from Hoài Huế over the years, like bánh bột lọc and bánh nậm, and they’ve always been dependably good. I highly recommend trying those if your party is extra hungry or looking to sample something new. 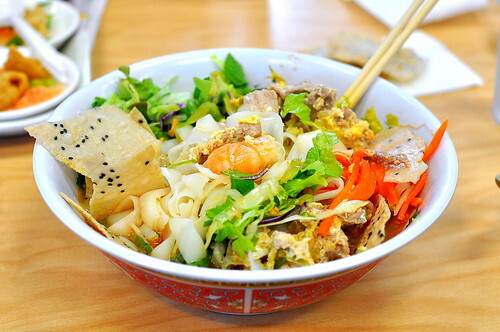 For our main dishes, everyone ordered the mì Quảng ($6), a noodle soup that originated in Quang Nam and Da Nang. The portions were so large that one bowl probably would’ve sufficed for every two people. Underneath the heap of peanuts, sesame crackers, carrots, greenery, and bean sprouts was a clear broth, a tangle of wide rice noodles, and a mixture of whole shrimp, sliced pork, and scrambled eggs. 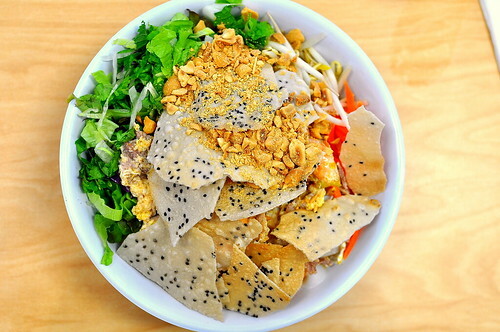 This version was different from what I ate in Saigon and Da Nang on a few noticeable fronts. For starters, the noodles were stark white rather than dyed turmeric yellow. Additionally, the broth was ladled on quite heavily. In Vietnam, mì Quảng is served on the drier side. The addition of scrambled eggs was new to me as well. It’s honestly been years since I’ve eaten this dish in Vietnam, but if memory serves me right, I remember it having more oomph. Hoài Huế’s version is satisfying, but mostly one-note. Even though the mì Quảng wasn’t made to Vietnam’s exacting standards, everyone polished off their bowls with gusto. Next time, I’m ordering the bún bò Huế that everyone keeps Yelpin’ about. auspicious date for their grand opening….fish sauce that is “off” is a travesty. Even though the mi quang wasn’t happening, i’m no very curious to try it! I will ask my sis-in-law about this asap. Yum! The way you describe (how the dish should be) it sounds amazing! oh man. those banh beos look soooo good! maybe next time i’m visiting the in-laws… thanks for the post! If you’re ever in Westminster, try “Ngu Binh Restaurant” for Central Viet food. Bánh Bèo Chén and mì Quảng is delicious! The noodles are turmeric yellow and served drier.